Less than a year after the liberation of Europe’s Nazi death camps it was back to business as usual for Britain’s fascists. They held open-air meetings at which speakers spouted crude antisemitism in the run-up to launching a successor organisation to Oswald Mosley’s British Union of Fascists (BUF). Horrified by a fascist revival, in March 1946 Jewish anti-fascists formed the 43 Group of Ex-Servicemen, bringing together Jews who had already been opposing fascist meetings with those who wanted to do so. The most prominent figure in this militant anti-fascist organisation’s early days was Gerry Flamberg, who had won the Military Medal and been wounded at Arnhem. After the war he had made a name for himself as one of the leaders of a march protesting against the internment of Jewish leaders in Palestine by the British authorities. By the end of April 1946 over 300 ex-servicemen had joined the 43 Group; numbers would eventually swell to 2,000. Members came from across the political spectrum, although, as one former member put it, “we were inclined towards the left rather than the right”. In May 1946, the 43 Group rented an office and employed Geoffrey Bernerd, an early recruit, as a fulltime organiser. Bernerd and Flamberg both became chairmen of the Group, with Bernerd organising while Flamberg assumed the role of public leader. Under Bernerd’s direction a formal branch structure was created. While the bulk of the members were engaged in physical attacks on the fascists, there were other necessary jobs. Recruits who had office skills, often women, were needed, as well as drivers, doctors to look after members injured in fights, and lawyers for legal advice. The Group also infiltrated fascist organisations using members who did not look Jewish, such as Doris Kaye, and non-Jewish members such as James Cotter, an Irishman. By mid 1946 Group activists were attacking several fascist meetings each week. In November 1946, the 43 Group had a letter published in the Jewish Chronicle calling for new recruits. In addition to gaining new members, it provoked a response the following week from the Jewish establishment in the form of the Board of Deputies of British Jews (BoD). Louis J Hydleman, chairman of the BoD’s Jewish Defence Committee (JDC), wrote to the newspaper attacking the Group. Hydleman argued that there was no need for a separate organisation from the JDC and that the Group should disband. This argument from the BoD mirrored the attack it had made on the Jewish People’s Council Against Fascism and Anti-semitism (JPC) in the 1930s. Hence, the revival of fascist activity saw the reawakening of the prewar defence debate in Britain’s Jewish community about the best way to fight antisemitism and fascism. This time on one side stood the moderate Zionist leadership of the BoD which, as in the mid-1930s, was hostile to any independent Jewish anti-fascist activity. In opposition were communists and militant Zionists who supported radical anti-fascist policies, especially those being put into practice by the 43 Group. The patronising tone of Hydleman’s letter apparently ill served his purpose. Even within the BoD the 43 Group had allies. Two communists, Maurice Essex and Jack Perry, had been elected to the BoD’s Trades Advisory Council (TAC), an organisation dedicated to combating antisemitism in business and industry. Essex also represented the TAC on the JDC, and Perry on the BoD itself. These businessmen, both members of the Communist Party of Great Britain (CPGB), were also prominent in the CPGB-inspired Businessmen’s Forum and had been sent into the heart of East London’s Jewish community to work on Phil Piratin’s successful CPGB general election campaign in 1945. They were not the only people on the BoD who supported militant anti-fascist activity, or the only communists active within the BoD. In November 1946, Mr A Stein moved a resolution calling for the BoD to conduct a campaign to demand legislation against antisemitism. After asking whether the JDC would continue the “cowardly and spineless” policy of the past, or would pursue a vigorous policy in alliance with the labour and progressive movements, he was accused of making “a Daily Worker speech”. Communists tried to win Jews over not by engaging in an anti-Zionist campaign, but by pointing to what they argued were the positive features of the socialist countries, particularly the role of the Red Army in defeating fascism and consequently saving Britain’s Jews, and the outlawing of antisemitism there. The communists pushed the view that the future for British Jews lay with the fight for greater democracy in a general sense. In particular, this meant the prohibition of fascism in Britain. The first year of the 43 Group’s existence was spent building the machinery capable of securing and maintaining anti-fascist activity. Little propaganda was produced during this early period, except for recruitment purposes. As the 43 Group gained more publicity, so it gained support from the wider Jewish community, both physically and financially. Antisemitic activity as a result of events in Palestine reached its height in the summer of 1947. On the August Bank Holiday weekend, news that the Irgun Zvei Leumi had hanged two British sergeants in retaliation for the execution of three of their men, led to anti-Jewish rioting in Britain. Mobs attacked Jewish shops and property in a number of towns and cities, including Manchester, Liverpool and London. In London fascist speakers made much of the “Palestine factor”. Meetings in Ridley Road in Hackney, east London – up to 3,000 strong and invariably addressed by Jeffrey Hamm – turned the area into a weekly battleground. Fighting between the 43 Group and the fascists, and often also between communists and fascists, became a regular event throughout the second half of 1947. One of the 43 Group’s main tactics was to close down meetings by knocking over the speakers’ platform. 1 To advocate the immediate passing of legislation to make Fascist and Anti-Semitic Organisations illegal. 2 To combat actively all Fascist and Anti-Semitic Organisations. 3 To awaken and unite all sections of the public against the menace of Fascism. 4 To develop an organisation capable of communal defence. 5 To work and co-operate with all bodies combating Fascism and anti-Semitism. By July 1947 the 43 Group had a budget of £30,000 and was able to launch a monthly newspaper. This worried those on the JDC, such as Hydleman, and another prominent member of the BoD, Professor Brodetsky, who met with the 43 Group in an attempt to contain the perceived problem of the existence of an independent Jewish anti-fascist body. At a JDC meeting held in July 1947, Hydleman expressed consternation that the 43 Group would not give up its separate identity unless it could have a major voice in the formulation of the BoD’s defence policy. In the ensuing discussion, Essex pointed out that the 43 Group received support as a result of the publicity it was obtaining. In little more than a year the 43 Group became an impressive organisation. It had a full-time organiser, an office, a monthly newspaper, a growing membership, and had infiltrated members deep into the fascist movement. On Guard of October 1947 was able to announce it had: “definite information that Mosley’s come-back will take place next month”. The accuracy of this information was confirmed later that year when Mosley’s Union Movement (UM) was formed. The event that gained the most publicity for the 43 Group was Flamberg’s alleged shooting with intent to murder of the fascist John Preen in December 1947. Charged with Flamberg was another founder member of the 43 Group, John Wimborne. Preen, who had been a member of the BUF and had been imprisoned during the war as a fascist section 18b detainee, was a prominent activist who had been a founder of the Britons Action Party and also ran a fascist bookshop. Flamberg and Wimborne were acquitted after the magistrate declared that Preen’s word was unreliable. In March 1948, On Guard reported: “The 43 Group have received a great volume of applications for membership of their organisation as a direct result of the Preen case”. The activities of the 43 Group aroused the interest of the authorities. The Daily Express reported in a front page story in December 1947: “Scotland Yard’s Special Branch has sent a report to the Home Office on the activities of a group of respectable and wealthy businessmen who are believed to be financing a new anti-Fascist movement in London. The unnamed movement was of course the 43 Group and the businessmen were from the Businessmen’s Forum, run by Essex. While the fascists organised for the return of Mosley to public political life, the 43 Group was determined to crush the newly formed organisation, which it argued “is not a new organisation at all, but the discredited BUF”. 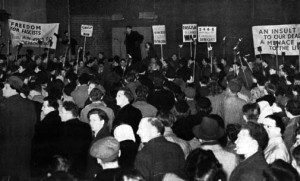 In May 1948, a march organised to demonstrate UM’s strength – from Highbury Corner to Camden Town – provoked fierce fighting outside Holloway Prison, resulting in 32 arrests. All marches, fascist and antifascist, had been banned from specified districts of metropolitan London by the Labour Home Secretary, Chuter Ede, but Mosley had simply altered his route. In 1948 some 43 Group members went to Palestine to fight in the Israeli War of Independence. It has been estimated that up to 30 members went, and some who stayed were also very active in supporting the emergent Jewish state. Len Rolnick, a leading 43 Group activist and CPGB member, travelled to Paris and, with the assistance of French Communist Party members at the L’Humanité newspaper, sent weapons to Palestine. Back in Britain, Rolnick discovered that the 43 Group was not the only organisation sending people to the Middle East. Some British fascists were apparently being recruited to fight against the Jewish state. Rolnick was given the task of finding out how this was being organised. He went along to the Arab Legion in London and was referred to the Anglo-Arab Friendship Society where he posed as a potential recruit. He succeeded in proving that recruiting was taking place in Britain, which was being denied at the time. The 43 Group’s primary objectives had been to expose the various fascist groupings and to prevent them building a new fascist party. The creation of UM prompted the 43 Group to embark on a new strategy in addition to the continued physical attacks on fascist meetings. The secondary campaign consisted of anti-fascist propaganda to “expose and if possible prevent them from carrying out their activities”. In the summer of 1948, the 43 Group held the first of a number of its own open-air meetings. However, UM turned out to be a shadow of the prewar BUF. Among its problems was that it suffered defections of some prominent members. The 43 Group worked with these former fascists and several spoke on On Guard platforms denouncing their former comrades and exposing fascism at meetings up to 1,000 strong. Under the leadership of Michael Maclean these former fascists eventually organised themselves under the banner of the National Anti-Fascist League. Although the 43 Group continued to attack fascist meetings, most spectacularly in Brighton in June 1948, when the fascists were given a decisive physical beating, it placed growing emphasis on the propaganda campaign. As part of this reorientation, the Group directed more effort into winning support from the Jewish community, largely as a result of the intensified anti-43 Group campaign by the BoD. Several meetings took place between the BoD and Group leadership to discuss a united defence campaign, but their differences proved too strong. Resolution of the differences could never come about because of the BoD’s unwavering insistence on the Group surrendering its identity. In September 1948 the Jewish Chronicle published an exchange of letters between supporters of the 43 Group and supporters of the JDC. In his capacity as JDC chairman Hydleman called on “all members of the Anglo-Jewish Community to cease from giving their support to this [the 43 Group] or any dissident group”. Writing on behalf of the 43 Group the following week, Bernerd called for the BoD to set up an “independent and fair-minded tribunal to bring about unity”. The 43 Group did have a somewhat better relationship with the Association of Jewish Exservicemen (AJEX). The 43 Group’s founders had been members of AJEX and many Group members retained dual membership. AJEX was very close to the BoD but there was just enough independence to allow them to work together on some occasions. The Group also worked with non- Jewish anti-fascist organisations and at the end of 1948 affiliated to the National Council for Civil Liberties (NCCL), with which the JPC had done much work in the 1930s. By 1949 it was clear that the building of a successful fascist party was not going as smoothly as Mosley had hoped. Some 700 people turned out to hear him speak at Kensington Town Hall in January 1949, where he returned to classic, prewar antisemitism. This was something he had personally played down since the war, but it was what his supporters wanted to hear and he could ill afford to ignore them. Over 3,000 protesters gathered outside at a demonstration organised by the 43 Group. Tear gas was set off inside the meeting and over 100 fascists required medical treatment for its effects. There were seven arrests, several of whom were 43 Group members. The decline in the fascists’ fortunes was not immediately obvious, however. In May 1949, On Guard reported its shock that Victor Burgess, a fascist candidate, had received 2.5% of the vote in the local council elections in Kensington South. In reality this was a small vote and the fascists were not making headway. Their lack of success in winning support turned to greater frustration, resulting in increased violence against “soft targets”. The worst incident took place in the run-up to May Day, when two 15-year-old Jewish boys required emergency operations after they were attacked with an array of weapons in the Ridley Road area. This was only the worst of many violent incidents during 1949. Chuter Ede reinstated the ban in London on political processions, but as in the previous year it was relatively ineffectual. However, the consistent violent opposition by the 43 Group and others, and the defections from UM meant that fewer fascist meetings took place through the latter part of 1949 than in previous years. In early 1949 the 43 Group suffered serious internal problems. It was having difficulty raising funds: the major reasons for which were the lower profile of the fascists and consequent apathy in the Jewish community. Bernerd halved the size of the executive committee and a number of veterans found that they no longer had a place on it. Flamberg resigned in May 1949, leaving Bernerd in control. On Guard started to appear infrequently. “There is a crying need to awaken in the Jewish community of this country a sense of its own responsibility and an awareness of the danger that exists for a Community burdened with an official leadership that can only arouse contempt. And if to do this it is necessary to expose the undemocratic methods employed by Jewish communal leadership to keep the community in ignorance and apathy, the 43 Group will not shrink from that unpleasant task. In fact, negotiations had started some ten months earlier when a conference was held with AJEX and the groups in Leeds and Manchester. The reason that no unity had been achieved was, according to the CPGB newspaper Jewish Clarion, that the AJEX leadership had stalled the process. So the 43 Group, as an organisation, closed down as opposed to being formally absorbed into AJEX. Rather than put all the 43 Group’s funds into the hands of the AJEX leadership, the Group divided them between a number of mainly left-wing organisations, only a portion therefore going to AJEX. Recipients included the CPGB newspaper the Daily Worker, the British Peace Council and the NCCL. Even after the disbandment of the 43 Group its leadership continued to believe it had not had a fair hearing. A letter sent by the Group to the Jewish Chronicle was not published. Instead the newspaper printed an editorial that claimed the BoD had encouraged AJEX to initiate a move towards unity. Incensed, Wayne, the former Group secretary, wrote to the Jewish Clarion, which published a letter putting the “true facts” of the negotiations. The 43 Group’s existence and success owed much to the political circumstances that created a window of time that lasted for only a very short period. From the mid to late 1940s communists supported the nascent state of Israel while many Zionists saw themselves as socialist or even pro-Soviet. The demise of the 43 Group occurred at the same time as the Cold War reached its height, and when support for communism among the Jewish community was waning quickly. Communists and Zionists once again came into conflict with each other, as had been the case historically. Even though full details of the liquidation of the Soviet Union’s Jewish Anti-Fascist Committee were not fully known, reports began circulating by 1948 of antisemitism there. The cooling of relations between Israel and the Soviet Union soon after the Jewish state was established meant that communists and Zionists were no longer united on this issue. Within a short time the Soviet Union was providing support and arms for the Arab states. Of course events abroad did take some time to permeate the political consciousness of British Zionists and communists, but what previously might still have united them was simply not there in 1950. The fact that the domestic fascist threat was less visible meant that the key unifying issue was in recess. In many ways this marked the end of an era; in 1950 Piratin lost his parliamentary seat. Such was the Cold War climate that even having a policy that was coincidentally the same as a communist policy was reason enough to change it. Spector resigned over this issue at the beginning of 1951 and the communal leadership spread the word that he was a communist. With the closure of the 43 Group came the end of another chapter in the defence debate. However, it was not to be buried forever and a new chapter opened a decade later with the fascist revival of the early 1960s, when the anti-fascist 1962 Committee – the 62 Group was formed.